Tha Trickaz spreads Bass all around the world, the duo from Paris (France) is composed by Pho (Dirtyphonics) and Dj iRaize (Tha New Team). Their sound is an hybrid and futuristic combination of Bass music, Hip-hop, Trap, Epic orchestras, Anime and Soundtrack influences. Tha Trickaz redefines the concept of Live in Electronic Music, their show is a unique experience : The 2 masked producers use their machines like real instruments and always drive the crowds crazy ! A good example : their POV "Pushing More button" Video, 62 famous samples played in real time drumming. This video went viral and hit more than 2,5 millions views within 24 hours and was shared on major blogs and medias on a worldwide scale. They performed in more than 300 concerts in the past few years, including big events and festivals such as the "Quicksilver Tony Hawk Show", Dour festival, Solidays, Techno Parade, and even 6 Asian tour. 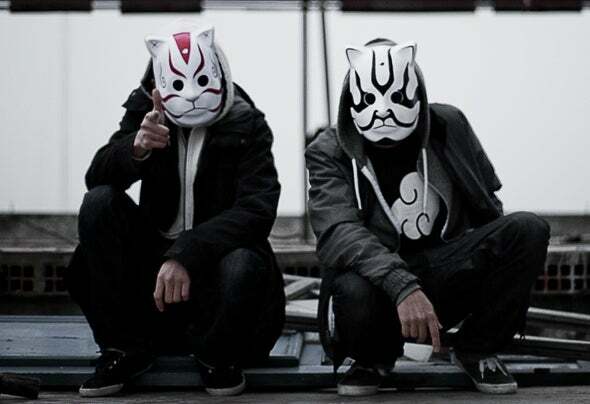 They produced tracks for many labels like Ninja Tunes, Firepower Records, Kannibalen, Smog Records, with many artists such as 12th Planet, Dope D.O.D, Cassius, Antiserum, Apashe, ETC ETC!, DJ Kentaro, Wax Tailor, Chinese Man… In November 2013, Tha Trickaz decided to create their own Free music label : Otodayo Records: Travelling between Bass music, Trap, Future beats, Hip-Hop and other Electronic genres, it gathers more than 200 million plays on all digital supports and 100 000 downloads. The project is a true success and the group is now preparing a new album who will be released in December 2016 with a brand new Live performance gathering more than 30m2 of leds live video done by D Labs agency : A unique and stunning show ! Nothing can stop them, whether it’s musical production, Live perfomances, or label management, Tha Trickaz masters everything they touch, so be certain you’ll still be hearing from them for many years to come !